Lots of how-tos on packing light, and travelling with just one small bag… The instructions on how to fold clothes are especially useful. Why not set this image as your desktop background for that extra something? 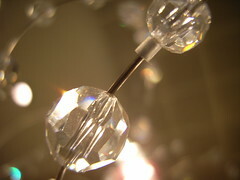 We spotted this crystal lamp in Peter Jones yesterday, and I tried to get a macro shot of the swarovski crystals catching the light. Not too shabby an attempt. The folk at blink.nu tracked down a brand strategy firm called Digital Kitchen, who have a concept video for Microsoft Origami on their Work site (all Flash – so click Enter, then Work, then Brandtheatre, and finally Microsoft Origami to see the video), which shows a device larger than a PDA, and smaller than a tablet PC, with fast wireless connectivity (WiFi and 3G) and handwriting recognition, plus the return of Smart Display. Is this the teaser site for Vista Beta 2? 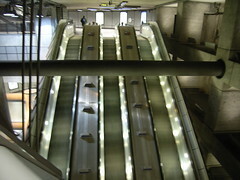 Lights, concrete, metal, and a set of escalators in constant motion. The grey cyberpunk space that is the Jubilee Line concourse at Westminster Station. For all you UFO fans out there, the US Navy is planning a sub-launched and recovered UAV. Unlike the combined plane/sub that was UFO’s Sky:Diver combination, the Cormorant UAV is intended to be blasted out of the missile launch tubes of a converted Ohio class SSBN. It looks like we’re slowly starting to live in a Gerry Anderson world. “Freelance journalists are the middle class, living an upper class life, on a working class salary”.